Liquid Shrinkage: It refers to the reduction in volume when the metal changes from liquid state to solid state at the solidus temperature. To account for this shrinkage; riser, which feed the liquid metal to the casting, are provided in the mold. Solid Shrinkage: it refers to the reduction in volume caused when metal loses temperature in solid state. To account for this, shrinkage allowance is provided on the patterns. The rate of contraction with temperature is dependent on the material. By draft is meant the taper provided by the pattern maker on all vertical surfaces of the pattern so that it can be removed from the sand without tearing away the sides of the sand mold and without excessive rapping by the molder. Draft allowance varies with the complexity of the sand job. But in general inner details of the pattern require higher draft than outer surfaces. The amount of draft depends upon the length of the vertical side of the pattern to be extracted; the intricacy of the pattern; the method of molding; and pattern material. The finish and accuracy achieved in sand casting are generally poor and therefore when the casting is functionally required to be of good surface finish or dimensionally accurate, it is generally achieved by subsequent machining. Machining or finish allowances are therefore added in the pattern dimension. The amount of machining allowance to be provided for is affected by the method of molding and casting used viz. hand molding or machine molding, sand casting or metal mold casting. The amount of machining allowance is also affected by the size and shape of the casting; the casting orientation; the metal; and the degree of accuracy and finish required. Sometimes castings get distorted, during solidification, due to their typical shape. For example, if the casting has the form of the letter U, V, T, or L etc. it will tend to contract at the closed end causing the vertical legs to look slightly inclined. 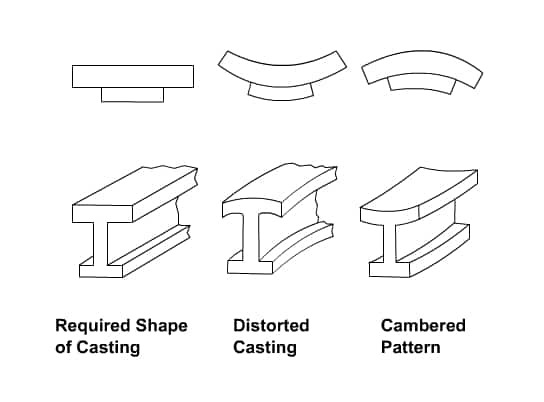 This can be prevented by making the legs of the U, V, T, or L shaped pattern converge slightly (inward) so that the casting after distortion will have its sides vertical. Before the withdrawal from the sand mold, the pattern is rapped all around the vertical faces to enlarge the mold cavity slightly, which facilitate its removal. Since it enlarges the final casting made, it is desirable that the original pattern dimension should be reduced to account for this increase. There is no sure way of quantifying this allowance, since it is highly dependent on the foundry personnel practice involved. It is a negative allowance and is to be applied only to those dimensions that are parallel to the parting plane.